Senior electrical engineering students Bill Hogan, Kevin Hichborn, Laurel DeMarco, and Scott Therien (left to right) pose with the trophy they won in a student robotics competition. Photo courtesy of Peg Hogan. Bill Hogan's brother Dan holds the tether for a climber test run. 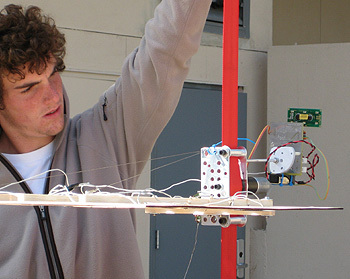 A team of four students from the Baskin School of Engineering at UC Santa Cruz won the first-place trophy in a national student robotics competition for their design of a solar-powered robot that can climb up a vertical ribbon while carrying a payload. Such a robotic climber would be an essential component of a "space elevator," a concept for transporting material into space via a cable or tether extending from the surface of the Earth into space. The competition, sponsored by the Aerospace Division of the American Society of Civil Engineers, was held at the 2008 Earth and Space Conference ("Engineering, Science, Construction, and Operations in Challenging Environments"), March 3 to 5, in Long Beach. The UCSC students--Bill Hogan, Kevin Hichborn, Scott Therien, and Laurel DeMarco--claimed the Fluor Daniel "Perpetual trophy for collegiate competition in extraterrestrial robotics." The four electrical engineering students built the climber as their capstone senior design project. Although it would not be suitable for a real space elevator, the overall concept is the same, they said. The scale of an actual space elevator would be mind-boggling. For the tether to reach geosynchronous orbit, it would have to be 22,236 miles long, Hogan said. In Long Beach, the robotic climbers went up a 20-foot ribbon of two-inch webbing. This was an especially challenging senior design project because of the wide range of problems that had to be solved, said John Vesecky, professor and chair of electrical engineering in the Baskin School of Engineering. Vesecky served as a faculty adviser to the team along with the other instructors for the senior design course--Pak Chan, associate professor of computer engineering, and Gabriel Elkaim, assistant professor of computer engineering. Lecturer Steve Petersen advised the group on the design of the power supply. "We are proud as the dickens of these folks, first of all for taking on this challenging project, and then for doing all of the mechanical engineering that it required, as well as the electrical engineering and computer engineering," Vesecky said. "They worked very smoothly as a team." The project actually grew out of the team's desire to do something involving solar power or renewable energy, Hogan said. Elkaim, a robotics expert, suggested the space elevator competition as an interesting application of solar technology, although it involves an artificial light source rather than the Sun to power the climber. The students worked together on the overall design and problem-solving, while each focused on a different subsystem. For example, DeMarco did all the software programming, Therien and Hogan worked on the solar array, and Hichborn worked on the remote control system. They weren't sure their climber would work until about 10 days before the competition. But in the end it outperformed the other entries, especially in its ability to carry a payload. 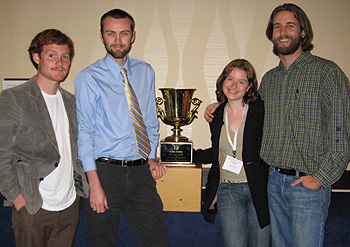 The UCSC team shared first place with another team that had almost the same overall score, although technically the other team's design did not meet the guidelines for the competition due to a misunderstanding. Their climber used solar power to charge a battery, but could not run directly off solar power. "It wasn't their fault, so they were allowed to compete. I felt bad for them, because they had put a lot of work into it and had come all the way from Ohio," Hogan said. The UCSC team's overall score was just a fraction of a percentage point higher than the other team's, he said.